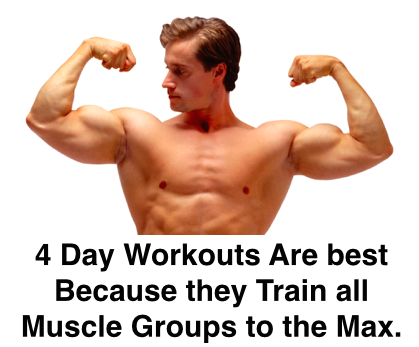 Is 4 day the best workout split for bodybuilding? What’s better than working out 3 days a week? Try the 4 day split workout routine and its muscle packing capacity will surprise you. In the Muscle building Workouts section you designed your perfect muscle workout. Now its time to jump in and follow a proven plan. 4 Day split training routines are excellent for intermediate and advanced bodybuilders with at least one year of solid training under their belt. Here you will find 2 plans. In Plan A you workout each body part twice a week. In Plan B you will workout each body part once per week but keep volume of each workout higher. My Tip: Both are excellent for muscle hypertrophy. Try Plan A for 4 to 6 weeks, then switch to Plan B.
I have kept the number of sets higher to cause more muscle stimulation and metabolic stress - the two prime muscle building causes. As you can see, the 4 day split routines are great for targeting every single body part. They are ideal for intermediate and advanced bodybuilders who can tolerate higher volumes. Try them and the results will surprise you. Just make sure your nutrition is perfect.